Glenelg’s iconic Watermark Hotel is well known for being an exciting and innovative part of South Australia’s bustling hospitality industry. Sitting on the foreshore of a popular seaside destination it’s a favourite of locals and tourists alike. As part of its proactive approach to customer engagement and promotion the venue was the first in SA to install a Sportspick GameZone. The Sportspick GameZone is an end to end sports bar marketing tool and according to the Watermarks Sports Bar manager, Dave MacDonald, it’s proven to be a revelation. “As soon as the GameZone was introduced we snapped it up, it was so professional,” said Dave. The GameZone combines Sportspick’s huge range of sports tipping and racing comps with the Game On live sports scheduling and promotion tool. The result is an engaging and eye catching unit which is revitalising sports bars around the country. Sportspick has added to the traditional AFL and NRL tipping with a huge range of sports tipping comps catering to sports fans of ages. On Saturday afternoon racing fans can stick around for a drink and a punt while taking part in the Punters Challenge or Triple Crown race tipping comps. And while the GameZone removes the hassles from running tipping comps and venue and sports promotion, it’s real strength is in the way patrons return to engage with it on a daily basis. 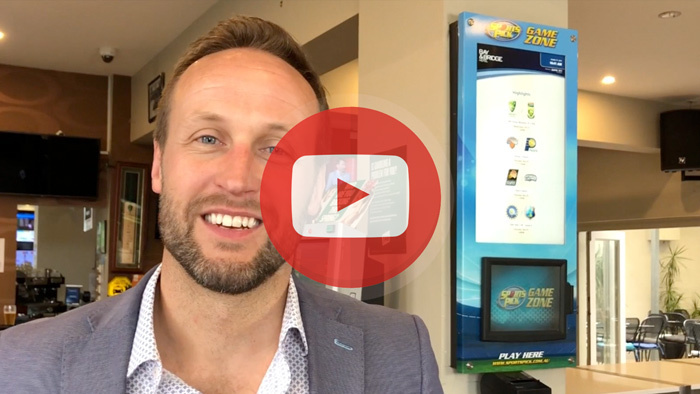 Watch here as Brayden Haynes explains how Sportspick GameZone attracts sports fans, and keeps them coming back.